Preheat oven to 300° F. In a microwave-safe bowl, melt butter and then stir in the brown sugar and hot sauce until sugar is mostly dissolved. Add pretzels and nuts to the bowl and toss with butter mixture until evenly coated. Spread mixture out in a baking sheet and bake for 20 minutes, stirring once halfway through. Let mixture cool and serve. Snack mix will keep fine in an airtight container for a week. If you use unsalted nuts, add 1 teaspoon kosher salt to the butter mixture. If you use salted nuts, there isn’t a need for extra salt. With the weather finally heating up, it’s always a good idea to have a few lazy picnic or barbecue snacks in your recipe arsenal. Sure, you could just pop open a bag of chips, but with minimal extra effort, you can make something really delicious. 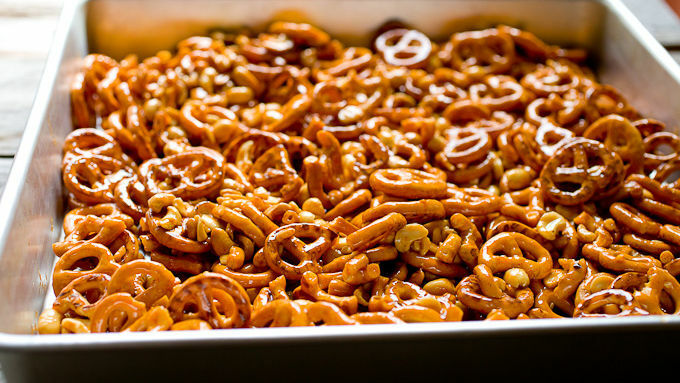 Say hello to this Sweet and Spicy Pretzel Mix! It has one of those perfect combos of slightly sweet, buttery, and spicy. It’s so addictive that you’ll find your hand just gravitating toward the bowl, even if you were thought you were done! 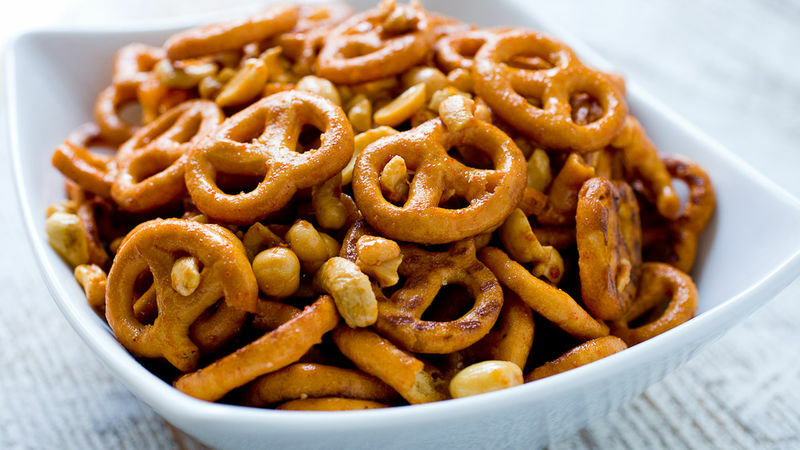 The recipe is pretty flexible, but I recommend using tiny pretzels and a mix of peanuts and cashews. If you want to use just pretzels, up the quantity to about 8 cups of pretzels. You could also toss in other nuts, if you wanted. For the sweet spicy mix, combine melted butter, brown sugar, and hot sauce together in a bowl. I like a standard Mexican-style hot sauce, but sriracha works well too. Feel free to go heavy on it since it will be distributed over the entire mix. Toss everything together and bake it at 300°F for 20 minutes. Give it a good stir halfway through to make sure it’s baking evenly. Let the mixture cool a bit before snacking. The brown sugar will harden a bit as it cools and give the snack mix an extra crunch. This stuff is seriously addictive! Happy spring time!